The Orchestre de Paris, one of France leading orchestras – which I had the chance to admire under conductors such as Carlo Maria Giulini, Georg Solti, Kurt Sanderling, Pierre Boulez or Daniel Barenboim to name but a few – organized a Mozart chamber music weekend in the elegant hall of the Conservatoire d’Art Dramatique. They invited legendary pianist Menahem Pressler, the co-founder of the Beaux-Arts Trio who played during all its 53 years of existence, who remains as active as ever in his 88th year! The opening programme started with the Divertimento for strings K.138, that Mozart wrote at the age of 15. I enjoyed the central Andante and the closing Presto more than the initial Allegro. The second work, the 2nd Piano Quartet, is much more familiar. 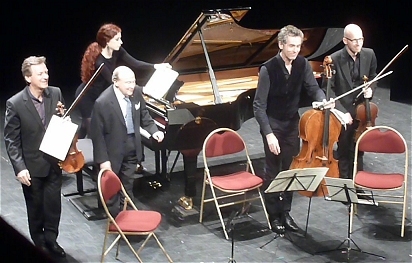 Roland Daugareil (orchestra Leader), Éric Picard (Principal Cello), David Gaillard (Principal Viola) and Menahem Pressler made it very visible that they were enjoying making music together and playing this beautiful piece. 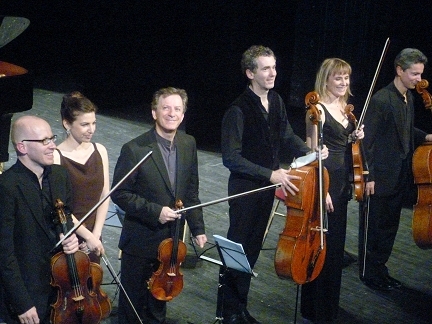 The introductory Allegro – as the whole composition – is a constant dialogue between the 4 instruments (which could be clearly seen in the attitude of the players, carefully listening to each other and often looking at one another), the Larghetto is rich in emotion, the concluding Allegretto is full of surprises and vigour, in the spirit of Haydn. After a moment of hesitation, Menahem Pressler finally sat at the piano to play a wonderful encore, Chopin’s Nocturne in C# minor Op. posth., a delight of delicacy. The concert was ending with a well-known work but in a very unusual form: the anonymous transcription for string sextet of the Sinfonia Concertante for Violin, Viola and Orchestra. Once you accept the idea and the obvious change of scale, much of the beauty and greatness of the work is still present. The audience apparently enjoyed the music as much as the musicians themselves, who were all smiles. Too bad the weather was not in harmony when we left the concert hall! This entry was posted in Classical concert and tagged David Gaillard, Eric Picard, Menahem Pressler, Orchestre de Paris, Roland Daugareil by MichelE. Bookmark the permalink.